Today’s guest poster, Zara Anishanslin, is Assistant Professor of History at the College of Staten Island/City University of New York. She received her PhD in the History of American Civilization at the University of Delaware in 2009, and from 2009-2010 was the Patrick Henry Postdoctoral Fellow in the Department of History at Johns Hopkins University. She’s at work on her first book, Embedded Empire: Hidden Histories of Labor, Landscape, and Luxury in the British Atlantic World (Yale University Press, forthcoming). Embedded Empire uses a single object—the portrait of a woman in a silk dress—and the four people who made it (the textile designer, the silk weaver, the colonial merchant’s wife, and the painter), to tell transatlantic material histories that challenge traditional narratives of emulative consumption. She also serves as Co-Chair of the Seminar in Early American History and Culture at Columbia University. Savannah is one of those southern cities where historic atmosphere and charm drape over everything like Spanish moss on live oaks. But amidst all this atmospheric charm, one of the sights I remember most was a distinctly uncharming thing: the desiccated body of a dead squirrel on a tray, tucked away in the attic of the Davenport House. I visited iconic Davenport House because it was the site of the Material Culture Colloquium at this year’s Society of Early Americanists’ conference. (For a report on the conference, see Rachel Herrmann’s blog post). I was lucky enough to be on the Program Committee and must say: fellow historians, try to get this gig (it’s a lot of fun and the lit scholars are very welcoming of our kind). When reading over submissions for this year’s conference, I was happily surprised to see a record number of papers using material culture. 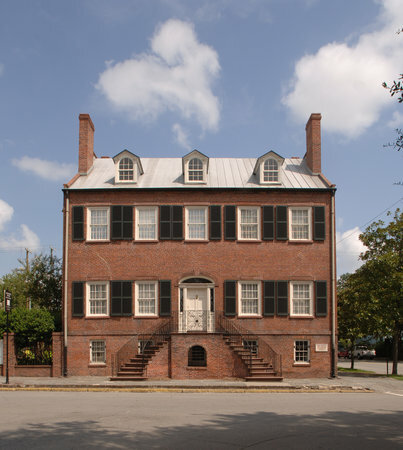 Panelists gathered in Savannah looked at such recognizable objects as clothing, landscapes, and material texts, and discussed less familiar things like tattoos, life preservers, nutmeg graters, and George Washington’s dentures. As fits the interdisciplinary nature of the SEA itself, historians, art historians, archaeologists, and lit scholars were all represented. (To get a flavor for the material culture papers presented, see the conference material culture blog). The idea behind the Material Culture Colloquium at Davenport House was really very simple: to provide a forum for this unusual critical mass of interdisciplinary scholars to discuss material culture. Questions that framed the Colloquium included: How does material culture affect or change our scholarship on early America? Where do we see disciplinary overlap? Where do we see divide? Is there a difference between visual and material culture? If we recognize (as, ahem, we should) that material culture is not just a type of evidence, but also a field, how do we define (and perhaps theorize) that field? How can we engage in cross-disciplinary conversations about material culture and its future? We decided to depart from the traditional model, where five or so smart people sit at a long table and give five to ten minute talks each before turning it over to audience questions. Instead, ours was little more than a loosely moderated conversation among a whole bunch of smart people, sitting in chairs. The hope was that this informal format would inspire lively discussion and collegial debate. It paid off; this turned out to be one of the more truly conversational exchanges I’ve seen at a conference. (And while I’m not suggesting this should be a new model, it’s worth considering whether including more conversational models like this to complement our standard conference panel format might not be a good thing. Though I admit I’m fully aware this might’ve been a really bad model had those who showed up for the colloquium not been such a brilliant and lively group). One theme that dominated the beginning of our discussion was how material culture might help us to “decolonize history.” Talking material culture turned to a discussion of how well it allows us to decolonize history, by reconstructing histories of the marginalized like Native Americans, women, and slaves. This is not breaking news about material culture, of course, but Colloquium participants used it to discuss the interesting issue of how material culture allows us to think more expansively about decolonizing history as an entire field. For example, how we might do so by decolonizing the evidence we use to construct it (material, visual, and oral, as well as textual). Another theme was that of “authenticity.” How do we reconstruct the most possible authentic early American past? And, contrarily, particularly if we’re writing or teaching, do we even want to? How do we combat the lure of the “spectacle of authenticity” (what one art historian pithily termed the “Ken Burnsiana” of early America)? Is it good or bad to encourage our students to play Assassin’s Creed III, or visit a museum exhibit? How fruitful is it to engage the sensory and the tactile (through things like the Decolonizing Diet project)? 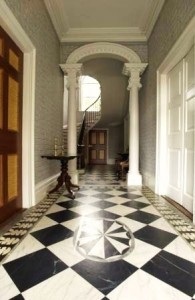 The Entry Hall, Davenport House (from Davenport House website). The colloquium reminded us that material culture is simultaneously a field of interdisciplinary conflict and cooperation. Art historians admitted to “frustration” at the “lack of sophistication” with which non-art historians engage things like portraits, while historians agreed that the material culture/visual culture distinction many art historians find important was largely irrelevant to their scholarship. Yet perhaps the most surprising thing was that we spent most of the Colloquium discussing how we could/should/do use material and visual culture to teach. As we ended after all too short a session, one scholar said that we should realize—and remember—that interdisciplinary is not the same thing as multi-disciplinary. In other words, disciplinary boundaries should be respected, even in something as inherently interdisciplinary as material culture. I’d like to suggest that while disciplinary boundaries should be respected, yes, they should also be tested and ignored. To make that point, I go back to Davenport House. Master carpenter Isaiah Davenport built the townhouse in 1820, and lived here with his wife, children, and slaves. He also used it as a material advertisement of sorts—a visually stunning way to prove his building acumen to prospective clients. It no doubt was successful. To this day, the nearly two hundred year old stairs do not shift or creak when walked on, and its most public spaces, like the entry hall, are decorated with graceful arches and pilasters that announce visual grandeur. Like most antebellum southern townhouses, this visual grandeur was at odds with the living spaces inhabited by the enslaved people whose labor kept the household going. One such space was the attic. In much the same way, the desiccated squirrel in that attic jars the viewer. It’s unexpected, funny, gruesome, and thought-provoking all at once, at least partly because it’s at odds with the familiar refinement of the house museum just passed through. As another early Americanist quipped after seeing the squirrel mummy, “You just can’t unsee that.”Like the first floor, the attic has carved wood and arches, but it is unfinished, with the details of its construction laid bare. It jars the viewer who’s just seen the architectural refinement downstairs. And no, you really can’t. The Attic, Davenport House (photo by author). In the same way, you just can’t unsee how that attic contrasts with that entry hall. You just can’t unsee the slave labor that built Savannah’s gracious charms. Seeing that squirrel in that space reminds me that material culture—and interdisciplinary discussion—can have a way of jarring, and that sometimes we need to be jarred. We need to decolonize our own scholarly ruts. SEA President Hilary Wyss, I think, summed it up best at the colloquium. She urged that we scholars must be willing to blunder (as we inevitably will), by looking at new types of evidence, and at the past, in unfamiliar and jarring ways. We must be willing to break out of our own insularity, try new things, and talk across disciplines, even if we’re not sure we’re doing it right. And we must remember to be kind to those who blunder too. Conversational colloquiums like the one we had at SEA are a good way to start. Thanks for the guest post. I especially liked the concluding two paragraphs, and I shall be on the look out for your book, Embedded Empire.